The Second High Criminal Court in western Izmir province on Friday ruled for American pastor Andrew Craig Brunson to be sentenced to three years, one month and 15 days in prison, but said he will not spend anymore time in custody because of the time he has already served. The court also ruled to lift all judicial restrictions on Brunson, lifting his house arrest and travel ban. This means Brunson can leave Turkey and return to the United States. The decision to release him came in the fourth hearing of an espionage case that caused a diplomatic dispute between Turkey and the United States. On early Friday, Brunson was taken from his house – where he had been under house arrest since July 25 – under strict security and brought to the prison and courthouse complex in the Aliağa district of western Izmir province for the trial. In the first part of the hearing that took place Friday morning, three witnesses retracted their previous testimony suggesting Brunson's links to the terrorist groups, including the Gülenist Terror Group (FETÖ) and the PKK, and denied any knowledge about Brunson's possible links with the groups. "I love Turkey. I'm innocent. I expect to be acquitted of all charges," Brunson said in his plea took place in a late afternoon session. The prosecutor demanded up to 10 years in prison for terror charges while asking judicial control measures to be lifted. His lawyer said that would mean he would be free to leave the country immediately. Lawyer Ismail Cem Halavurt said on Friday Brunson was expected to leave Turkey for the U.S. The Turkish Presidency responded to the ruling with a statement saying: "Today's court ruling on Andrew Brunson reaffirmed that Turkey is a democratic country with the rule of law, and established the independence and impartiality of the Turkish judiciary." The statement by the Presidency's Communications Director Fahrettin Altun added that Turkey, with "great regret," has been monitoring "U.S. efforts to mount pressure on Turkey's independent court system for some time," including the imposition of sanctions. "The President has repeatedly stressed that Turkey would not bow to those threats and noted there could be no guardianship over the independent and impartial judiciary. He urged all party's to respect the court's final decision," the statement added. In response to a tweet Friday by U.S. President Donald Trump — which said, "Working very hard on Pastor Brunson" — the presidency once again reminded the U.S. leader of the independence of Turkey's courts. Hours later, Brunson was transported to Izmir's airport and was flown out of Turkey, where he had lived for two decades. He was expected to be flown to the U.S. military hospital in Landstuhl, Germany. Trump welcomed the pastor's release, saying he is likely to visit the White House Oval Office on Saturday. When asked about the possibility of removing sanctions on Turkey, Trump told reporters there was no deal made for Brunson's release. Relations between Turkey and the United States were strained over the past few months by the trial of Brunson in Turkey on terrorism charges. Brunson, who has worked as an evangelical pastor at the Evangelic Resurrection Church in the western city of Izmir for the past 20 years, was arrested in Turkey in September 2016 for alleged links to the PKK and FETÖ, the group that orchestrated a coup attempt on July 15, 2016. On July 25, citing Brunson's health problems, an Izmir court ordered him moved from jail to house arrest. Brunson is charged with the "seizure of confidential state information for the purposes of politics and military espionage and attempting to abolish the Grand National Assembly of Turkey, the government of Turkish Republic and constitutional order." The pastor faced 35 years in jail on charges of espionage and committing crimes on behalf of FETÖ and the PKK. He was moved from jail to house arrest last July due to health concerns. On the Turkish side, President Recep Tayyip Erdoğan said Tuesday in relation to the issue that: "Since Turkey is a state of law, I am not in a position to interfere with the judiciary. Whatever the judiciary decides, I have to comply with that decision. Those involved with this also need to abide by the judiciary's decision." 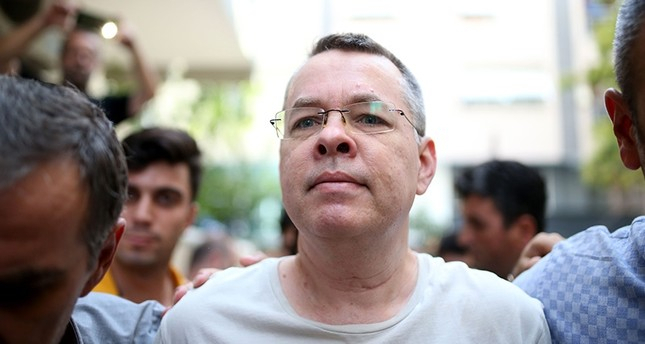 Following the arrest of Brunson, U.S. President Donald Trump, who received 81 percent of the evangelical vote in the 2016 elections, made it abundantly clear that the United States expects Turkey to release Brunson immediately and pushed deadlines for his release. Accordingly, U.S. Vice President Mike Pence also threatened Turkey by saying, "Release Brunson now or be prepared to face the consequences." However, Turkey refused the demands, emphasizing that it was a judicial case. Shortly after the court announced the decision, Trump sent a tweet on Friday, saying, "Working very hard on Pastor Brunson!" "My thoughts and prayers are with Pastor Brunson, and we hope to have him safely back home soon!" Trump wrote in another tweet. Washington slammed sanctions on Turkish Interior Minister Süleyman Soylu and Justice Minister Abdülhamit Gül due to their "leading roles in the organizations responsible for the arrest and detention of Brunson." Moreover, the U.S. Congress passed a bill delaying the delivery of new generation fighter F-35 aircraft to Turkey. Trump also doubled tariffs on Turkish aluminum and steel on Aug. 10 to coerce Turkey into making a decision. Tensions further mounted between the two NATO allies as the tariffs and sanctions led to a plunge of around 40 percent in the value of the lira against the dollar this year. However, Erdoğan remained defiant over the sliding lira and vowed Turkey will not be brought to its knees through economic manipulation. Accordingly, Ankara responded in kind by raising tariffs to 100 percent on several U.S. products, including alcohol, tobacco and cars. Many countries, including Russia, Pakistan and China, expressed their support for Turkey. German Chancellor Angela Merkel also criticized Washington by saying that it is in everyone's interest for Turkey to be "economically prosperous.